Mexico claims California by eminent domain…Look for this headline by 2050! I know that I was not the only one bothered by the plethora of Mexican flags at the supposed “Pro-Immigrant” rallies over the weekend. I mean, if their goal is to come to America and share in the American Dream, one would think that they would be waving the red, white and blue of the American flag. But is that really their goal? I am all for immigration… legal immigration. My wife and her family are immigrants from the Fiji Islands. But they went through all the hassle and paperwork it took for them to come to the United States and become legal residents and eventually citizens. They recognize that their being able to come here and live as citizens is a privilege, not a right. But many of those who marched in the streets this weekend were declaring something all together different. In their chant of “Estamos Aqui” , which is Spanish for “We’re Here!” they are claiming what we used to call “Squatter’s Rights” . In other words, this is their land simply because they are here. They are not asking to be citizens of our country. They have a country to which they are loyal… Mexico. And as far as many of these folks are concerned; California, Colorado, Utah, New Mexico, Arizona and Texas were stolen from Mexico. And they are here to reclaim these “Occupied territories” through an effort they refer to as “La Reconquista” , which is Spanish for re-conquest. • Unlike past immigrant populations who went out of their way to learn English and integrate into American culture, many in this current wave of immigrants from Mexico are doing as much as possible to prevent any sort of assimilation. • In the survey titled, “American Views of Mexico and Mexican Views of the U.S. “, Zogby conducted interviews of 801 adults chosen at random throughout Mexico, from Friday, May 25 to Saturday, May 26, 2002. . One of the survey questions was “Do you agree or disagree that the territory of the United States’ Southwest rightfully belongs to Mexico?” 58% Agreed, 28% Disagreed and 14% weren’t sure. • MECHA, which stands for Movemiento Estudiantil Chicano de Aztlan has in the preamble of it’s constitution : “Chicana/Chicano students of California must take upon themselves the responsibilities to promote Chicanismo within the community; as well as politicize our Raza (Race) and continue the struggle for self-determination of the Chicana/Chicano people and the liberation of Aztlan.” Additionally, Article II, Section 1 reads, “General membership shall consist of any student who accepts, believes and works for the goals and objectives of MEChA, including the liberation of AZTLAN, meaning self-determination of our people in this occupied state and the physical liberation of our land.” What land do you think they are referring to? 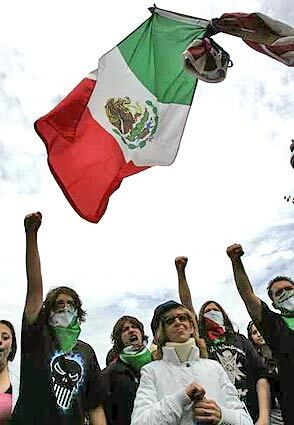 Gochez: We are the nation of Aztlan. O’Reilly: All right that’s good, you are the nation of Aztlan. That’s great. Do you want your own territory? Do you want them to give you some land? Gochez: We understand that we are sitting on stolen land. This is indigenous land. This is native land, you know, Mexicano land. O’Reilly: So if I gave you Arizona would you be happy with that? Gochez: They took a lot more than Arizona. O’Reilly: So you want more than that? Now I’m not much of a conspiracy theorist. But when a group of people claim that they want to take over and repatriate part of America back to Mexico; and their actions demonstrate a substantive pattern that proves this to be true; what am I supposed to think other than that America is under attack? All be it a non-violent attack, but an attack none the less. I am also willing to recognize that his entire theory could be entirely untrue. But I have not seen much evidence of it in the actions of those who are protesting a bill that would do nothing more than is done by any of the socialist countries in Europe (you know… the ones liberals claim we should be more like) to protect their boarders. 1. Put down the Mexican flag and pick up the American flag. The flag you wave tells us where your allegiances lie. 2. Demand as a part of immigration reform increased funding for education in English for all would be citizens. Such funding may or may not be needed, but requesting it makes a statement that you are willin to fully be a part of American society. 3. Stop trying to undermine the American cultural and economic values. The reason why America has been so blessed is because of these values, which happen to be unique to our country. Assimilation does not mean that you have to give up your culture. It means including your culture into what it means to be American, while at the same time embracing the predominant culture of this land. Undermining those values in order to make us more like Mexico… well… it hasn’t worked out so well for Mexico; Has it? 4. Support immigration reform. Take a stand against illegal immigration and for the rule of law. Furthermore, aggressively support substantive reforms to streamline the process by which hard working, law abiding immigrants can come to the US and enjoy the blessings of freedom that can only be found here in America.